Business leaders across all sectors recognise the need to increase the output of their workforces but despite their best efforts, UK productivity growth remains lower than it was before the financial crisis in 2008. Contributor Alexandra Hopkins, Head of Consultancy & Design – Knowledgepool. Productivity within an economy or a workforce is an extraordinarily complex concept which is impacted by, and impacts on, virtually every area of an organisation and its wider market. I am not for one moment going to pretend to have all of the answers here! However, what I do want to focus on is the part that L&D, and the wider HR department, can and should be playing in addressing productivity within a workforce. Without doubt, skills comprise a major part of the productivity puzzle and therefore L&D departments, as the guardians of learning and skills, increasingly find themselves in the hot seat for tackling the most critical strategic priority for organisations today. We recently undertook research to better understand the current relationship between L&D and productivity within UK organisations; how this is changing; and how L&D professionals are and should be driving workforce output. The full findings are available in the white paper, L&D: Agents of Productivity but here I’m going to share some of my reflections on the research and what ownership of productivity means for today’s L&D professionals. When it comes to solving the productivity problem, so much of the narrative focuses on issues of skills shortages and new technology. 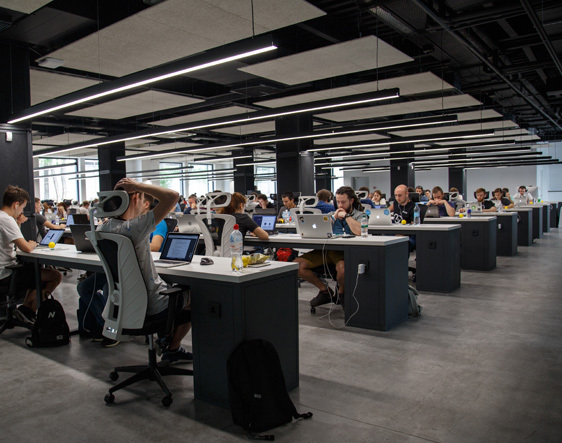 As businesses, we talk about skills shortages and mismatches and the need for up-skilling and re-skilling within the workforce; and elsewhere, digital transformation and new technologies are heralded as the quickest way to boost productivity. But when it comes to technology, far too many organisations are missing the important point which is that technology is and will never be a silver bullet to solve productivity issues; it is an enabler, allowing people to undertake higher value work, fulfil their potential and be more productive themselves. In some cases, this heavy fixation and often indiscriminate investment on technology is having a negative effect. Our research found that 41% of L&D professionals think that digital transformation has become a distraction for organisations; one that it is actually making their organisation less productive. Sure, skills and technology are essential components within the productivity puzzle but it’s important to recognise that both are ultimately a conduit to making people (or workers) more productive. That’s the point – productivity, as with everything in business, essentially comes down to people – and therefore that should be the lens through which the productivity challenge is viewed. This means putting people at the heart of any strategic drive to boost productivity or transform an organisation. And it means businesses ensuring a first class, consistent experience for employees at all stages of their journey – from recruitment and onboarding, training and development, to rewards and incentives and beyond. Optimising skills and driving productivity cannot be ‘done’ to people; L&D (and HR more broadly) must engage them in the journey, ensuring they buy in to the future vision of the organisation and clearly see their role in contributing to success (and the rewards for doing so). So put people at the heart of any productivity strategy and build from there, ensuring employees have access to the skills and technology they need to deliver more. Our study highlighted that ‘ownership’ of productivity as a strategic business priority is currently spread across different business functions, with little consistency across organisations. However, a large majority of both business managers (85%) and L&D professionals themselves (84%) believe that L&D should take responsibility for addressing the challenge. It’s encouraging that L&D professionals are eager to step up to this challenge (we see this amongst our clients) but it’s vital that they are smart and considered in how they approach the productivity puzzle. Rather than reverting to ‘traditional L&D thinking’, a bottom-up approach where the default setting is to immediately look to identify the most appropriate training programme to solve a problem, L&D professionals need to take a more strategic, top-down approach here. This means starting with how productivity is defined and measured in a way that is appropriate and relevant to the organisation; and from there, objectives, gap analyses and action (and training) plans can be formed. Productivity is a complex enough beast as it is – never mind without a well-defined and comprehensive plan. If L&D is to succeed in boosting productivity, then it needs to think ‘beyond training’ and focus on delivering positive change across the organisation and driving genuine commercial outcomes. Our previous research found that 44% of business managers are frustrated by their L&D department’s lack of collaboration and alignment with the wider business. So whilst L&D may be best placed to take responsibility for productivity, possessing all the right skills, connections and vision, it cannot attempt to tackle the productivity challenge in isolation. L&D, so used to working in a silo on the fringes of the organisation, must be bold and use productivity as opportunity to put itself at the centre of the organisation, leading, collaborating and advising with every part of the business, including senior leadership. L&D and HR must champion a people-first approach to increasing productivity, working alongside stakeholders from finance, IT and operations to implement the positive changes and instil the behaviours that will improve performance and outputs over the long-term. To finish on a positive note, however, despite the significant challenges it faces in tackling productivity, this is a golden, once in a career opportunity for L&D practitioners to transform their profession, and indeed their own careers, over the coming years. By being bold and brave, by being willing to learn, collaborate and lead, L&D can prove beyond all doubt the strategic and commercial value that it can deliver to an organisation (and its people).